Where beginners, seasoned amateurs, and the world’s fastest pros come together to enjoy 3 days of mountain bike culture, live music and world-class singletrack. 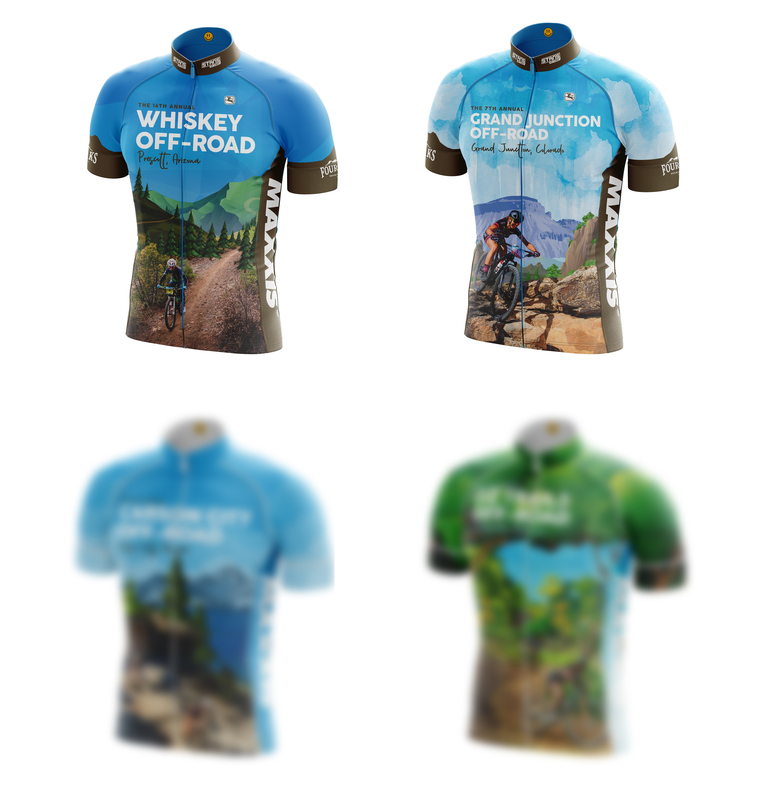 • Registration for the Whiskey Off-Road Professional Fat Tire Crits & Backcountry Races will remain open until Monday 4/22 at 9a (AZ Time). • Epic Rides offers Flat-Fee Registration – Fees include $10 donation to event beneficiaries, processing fees, and applicable taxes. No surprises at checkout. Save $10 – Purchase event jersey during registration. The Official Event Jersey features include a relaxed fitting jersey with 3 rear pockets, and fine silicon interior waist gripper. High quality clothing manufacturer will be announced this spring. Date of Birth (MM-DD-YYYY): * Please provide your birth date in MM-DD-YYYY format. Estimated Finishing Time: * I don't know 2 - 4ish hours 4 - 5ish hours 5 - 6ish hours 6 - 7ish hours 7 - 8ish hours Need help estimating your finishing time? Distances with 500+ participants will be broken into multiple wave starts. This enhances rider safety while decreasing potential impact to the trails. Step 1: Choose your course – short, medium or long. If you are registering for two or more distances, choose the longer distance. In the interest of optimizing your ride experience and those around you at the start line, Epic Rides encourages all participants that aren’t sure about their estimated finish time to decrease their guesstimate by 1 mph. After all, your Epic Rides experience is not about feeling rushed, it’s about having …a good day on the bike. Pro Tip: Not sure how fast you ride? Check your latest Strava tracks to see your average speed. This waiver is applicable to any and all of the events that make up the Epic Rides Off-Road Series. The series consists of the Whiskey Off-Road, Grand Junction Off-Road, Carson City Off-Road and the Oz Trails Off-Road endurance mountain bike events and community festivals. Please read to the bottom and then provide your signature in acknowledgment that you’ve read and understand the following assumption of risk, waiver and release of liability agreement as it applies to your participation in one of or multiple Epic Rides Off-Road Series events. Assumption of Risk: I understand that participating in an Epic Rides Off-Road Series endurance mountain bike event exposes me to many hazards, and entails unavoidable risk of death, personal injury (at any level of severity) and loss of or damage to property. I also understand that I should be in good physical health and properly trained to participate. Waiver and Release: In consideration of the acceptance of this entry, I assume full and complete responsibility for any injury or accident which may occur while I am traveling to or from the event, during the event, or while I am on the premises of the event. I also am aware of and assume all risks associated with participating in this event, including but not limited to falls, contact with other participants, effect of weather, traffic, natural obstacles of nature and conditions of roads and/or trails. I, for myself and my heirs and executors, hereby waive, release and forever discharge Mountain Bike America, LLC. Dba Epic Rides, the event organizers, sponsors, land owners and managers, their Boards, officials, employees, and agents, promoters and each of their agents, representatives, successors and assigns, and all other persons associated with the event, from any and all claims, actions, liabilities, costs, damages, or expenses, including but not limited to court costs and reasonable attorney’s fees arising out of bodily injury or death, or tangible or intangible property damage, which I or my heirs, executors, successors or assigns ever may have in connection with participation in this event and hereby waive all such claims, demands and causes of action. I attest that I will participate in this event as a bicycling entrant; I will wear an approved helmet; that I am physically fit and have sufficiently trained for the completion of this event and that my physical condition has been verified by a licensed medical doctor. I understand that the entry fee is non-refundable and non-transferable. I hereby grant full permission to any and all of the above parties to use any photographs, videos, motion pictures, website images, recordings or any other record of this event for any legitimate purpose. I hereby grant full permission to Mountain Bike America, LLC. Dba Epic Rides (in accordance with HIPAA standards) to access any medical information recorded regarding my condition during an Epic Rides Off Road Series endurance mountain bike event. The Whiskey Off-Road 15 Proof is finished at 6:00 p.m. on Friday, April 26, 2019; all course support will be closed at 6:00 p.m. The Whiskey Off-Road 30 and 50 Proof events are finished at 4:00 p.m. on Saturday, April 27, 2019; all course support will be closed at 4:00 p.m. In acknowledging this waiver you agree to be totally responsible for your own safety and support after 6:00 p.m. on April 26 or 4:00 p.m. on April 27, 2019 accordingly. The Grand Junction Off-Road 15 Grand is finished at 6:00 p.m. on Friday, May 17, 2019; all course support will be closed at 6:00 p.m. The Grand Junction Off-Road 30 and 40 Grand are finished at 4:00 p.m. on Saturday, May 18, 2019; all course support will be closed at 4:00 p.m. In acknowledging this waiver I agree to be totally responsible for my own safety and support after 6:00 p.m. on May 17 or 4:00 p.m. on May 18, 2019 accordingly. The Carson City Off-Road Capital 15 is finished at 6:00 p.m. on Friday, June 28, 2019; all course support will be closed at 6:00 p.m. The Carson City Off-Road Capital 35 and 50 are finished at 4:00 p.m. on Saturday, June 29, 2019; all course support will be closed at 4:00 p.m. In acknowledging this waiver I agree to be totally responsible for my own safety and support after 6:00 p.m. on June 28 or 4:00 p.m. on June 29, 2019 accordingly. The Oz Trails Off-Road Ozark 25 is finished at 6:00 p.m. on Friday, October 11, 2019; all course support will be closed at 6:00 p.m. The Oz Trails Off-Road Ozark 35 and 50 are finished at 4:00 p.m. on Saturday, October 12, 2019; all course support will be closed at 4:00 p.m. In acknowledging this waiver I agree to be totally responsible for my own safety and support after 6:00 p.m. on October 11 or 4:00 p.m. on October 12, 2019 accordingly. In signing this waiver I agree to be totally responsible for my own safety and support in one of or multiple Epic Rides Off-Road Series events. • Only one discount or coupon per registration. Note that the multi-event discount is greater than the $10 coupon per 30/50-ish event. • Register early to receive an insanely soft event t-shirt, custom number plate, event poster and a goodie bag full of samples from event sponsors. • The exact distances will be +/- a few miles, and therein lies the adventure, Kemosabe.